A native of Whatcom County, Niels Brisbane grew up surrounded by the iconic beauty and bounty of Northwest Washington. 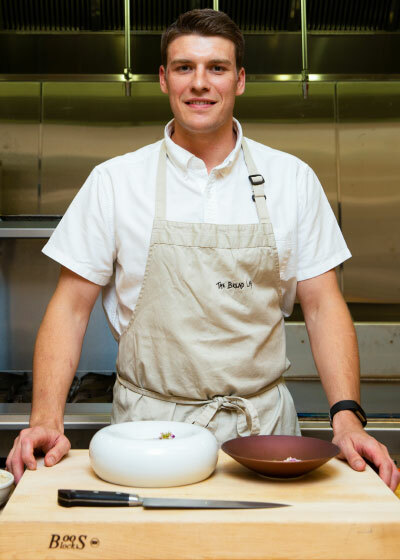 After attending UC Davis for his bachelor’s degree, he moved to Seattle and attended culinary school to continue to refine his cooking skills. After gaining some experience in other Seattle restaurants, Brisbane began working at Seattle’s iconic Canlis Restaurant, and worked his way up to Sous Chef, where he was in charge of fermentation and menu development. While at Canlis, Brisbane worked with Dr. Stephen Jones at The Bread Lab to begin implementing delicious and unique whole grains, grown in the Skagit Valley onto the restaurants menu. This multi-year partnership eventually lead to Brisbane making the move from restaurants to The Bread Lab where he is now the Culinary Director. Now focusing on connecting the bounty of the rural producers with the urban markets, Brisbane is using Whatcom and Skagit produce to facilitate learning and connections between the local markets.